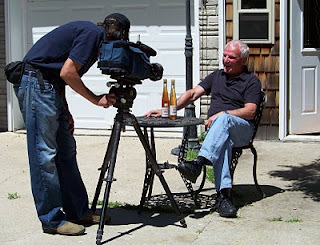 Last week, Steve Henning and his cameraman stopped in for a tour and filming of the vinegary. Today, Jason Davis and his cameraman Dave spent three hours filming for an upcoming news segment. I’ve tiptoed through the tarragon with a lot of people, but Jason has to be the heart-throbbingest of them all. There was that Australian opera singer…. But seriously, Ron and I have been tripping through life together for 37 years, as of tomorrow, and we’re going out tonight to celebrate. It’s been quite a ride and it isn’t over yet. It's out! 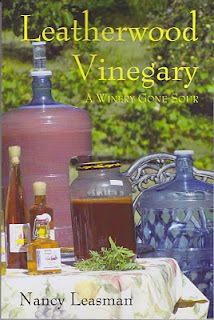 The book about a life infused with vinegar was released on Thursday of this last week. I drove up to Dorset to join a gaggle of authors signing books at Sister Wolf Book's Authors and Artists' Festival on Friday. What a delightful small town. The winter population is 22. The summer population probably doesn't change since it fills with day visitors who eat at the Mexican or Italian restaurants, brouse the cozy book store or shop for antiques and then wander back to the area's resorts, inns and B&Bs. It was a buzzing place on Friday. It feels pretty good to have the book on shelves though it's just a little too soon to find it in your local book store. Early reactions are good. If you'd like a copy, just e-mail me for details. leatherwood@wisper-wireless.com. According to one source, today is National Vinegar Day. We neglected to celebrate it in a meaningful way other than scheduling vinegary tours and spiffing up for the one on the agenda for tomorrow. Ron's rattling around in the vinegary right now. The rhubarb is in season and he's making wine. 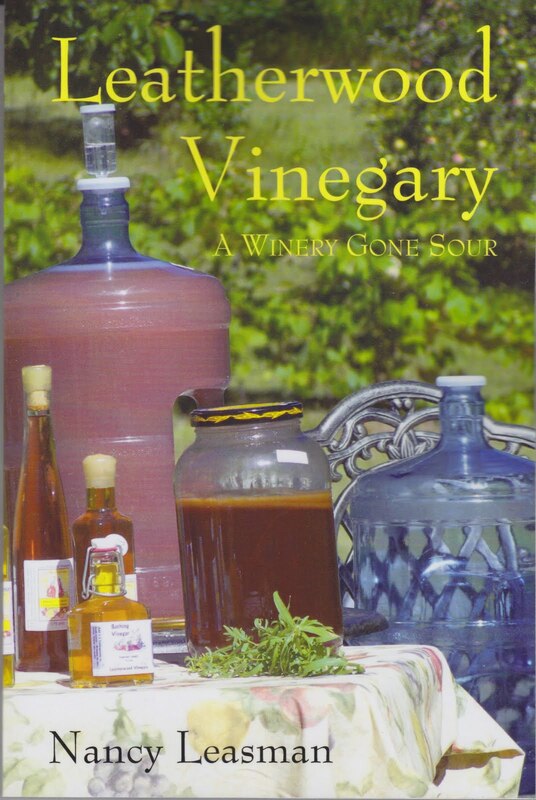 There's usually wine to rack off, vinegar to test or bottle, and new batches to get started. My publisher says the Vinegary book went to the press on Monday. 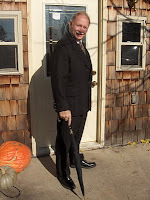 The first book signing is scheduled for a week from Friday at Sister Wolf Books in Dorset. I'll see you there! Who will win? The tall grass and the jungle thicket, or me? I wield one form of vorpal blade or another. Hacking back the already gone to seed grass with the weed whacker, spewing bull thistle juice, a salad of miscellaneous broadleaf weeds and poison ivy, I move around the yard. Little rewards emerge: a small flash of red amongst the hostas and I find wild strawberries. The chipmunks usually get them, or at least I blame them when I can’t find any. Wild roses appear as I scythe the grassland threatening to hide the mailbox, and the Leatherwood sign hanging beneath it. I notice the willow sticks marking the ends of rows in the garden. Ron and Jim, whose thumbs must be greener than mine, have even made these garden markers sprout leaves. Dead branches in the hedge row beg pruning. Grass in the grape vines needs to be pulled. I’ve run out of gas in the trimmer. I’ve assigned Savannah to pick up the rocks that the garden planters have tossed into the grass and to mow more of the lawn. Already it’s lunch time. And a vinegar customer is on his way. I’ll get back to my feeble attempts to control nature this afternoon. Ron's headed for the Twin Cities today to spear head some marketing efforts with the Whole Farm Co-op. It's wintery and cold but it won't be long and we'll have more icicle dripping days and water running in rivulets. With all this snow, it's going to be a wet spring. As spring heads this way, I want to send out a reminder that Leatherwood Vinegary will be featured on Pioneer Public Television's "Prairie Yard and Garden" on March 18 at 7:30 p.m.
Jason Davis has called and plans to stop in to tape a segment for his "On the Road" show. We'll let you know when to watch for that. The Todd County Horticultural Event, March 13 in Long Prairie at the Baptist Church. The East Ottertail Horticulture Day, March 20 in Perham at the high school. The West Ottertail Horticulture Day, March 27 in Underwood at the school. My book about the vinegary should be coming out in March, too. More on that as we get closer to the publishing date.